Regina Root has been awarded the prestigious Arthur P. Whitaker Prize for her book titled Couture & Consensus: Fashion and Politics in Postcolonial Argentina. This marks the second time that Root, Class of 1963 Term Distinguished Associate Professor of Modern Languages and Literatures at William & Mary, has received the award. She was awarded the Whitaker Prize in 2006 for The Latin American Fashion Reader. The Arthur P. Whitaker Prize is awarded each year by the Middle Atlantic Council of Latin American Studies (MACLAS). The award is given to the best book published in the last two years by a MACLAS member. A committee of select Latin American Studies scholars judges the submissions every year. “The Whitaker Prize came as a complete surprise!” said Root. ”It's a tremendous honor to receive an award earned by many other distinguished professors whose work I greatly admire." 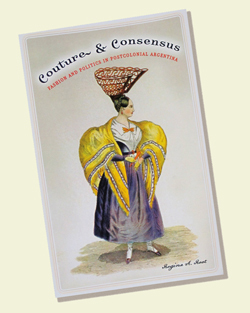 Couture & Consensus, the result of years of research in special collections in Argentina, details the influence of fashion on Argentinian politics after the revolution of 1810, and how creativity emerged through the use of clothing to convey ideas about the emerging nation's future. Published in June 2010 by the University of Minnesota Press, Root’s book has been garnering respect from the academic community and the general public alike. She was invited to present her work at the Library of Congress in March 2011. Later this fall, Editorial Edhasa of Argentina will publish this work. “Anyone who does archival work usually describes a process that involves a lot of patience, perseverance and detective work. It’s now incredibly satisfying to see this work in print and share it with readers,” said Root.